A controversial plan to build a hydroelectric plant in the open pits of an old iron mine was granted a license on Thursday by federal regulators. The decision to permit the project at the abandoned Eagle Mountain mine prompted strong criticism from residents who say building two large reservoirs in the desert would severely deplete the water supply and harm the wildlife in adjacent Joshua Tree National Park. The decision by the Federal Energy Regulatory Commission was a significant step in years of efforts by Santa Monica-based Eagle Crest Energy Company to win government approvals and financial support for the project. Significant hurdles remain, however, for a project that would cost more than $1.5 billion and that has drawn criticism from other federal agencies as well as environmental groups. "This is a very important milestone that gives us a lot of momentum, and there are individuals with the utilities that are very excited about this project," said Steve Lowe, president of Eagle Crest Energy. "The issuance of the license is the culmination of a very long environmental review, which includes many, many mitigation measures to ensure that the environment is protected as we go forward with the project." The proposed Eagle Mountain Pumped Storage Project would involve pumping water from a lower reservoir to a higher reservoir during times when electricity from nearby solar plants and wind farms exceeds demands, and letting the water run downhill to generate power during other times when electricity is needed. In order to fill the reservoirs, an estimated 28,000 acre-feet would be pumped from the aquifer in the Chuckwalla Valley over a period of four years. That's about 9 billion gallons, or enough to supply water for a year to more than 40,000 homes with typical levels of water use. Lowe said that factoring in evaporation over 50 years, about 100,000 acre-feet of water would be needed. "It's less than 1 percent of what is estimated to be in the aquifer right now," Lowe told The Desert Sun in a telephone interview. "It's actually quite reasonable and responsible for what we're achieving in reduction of greenhouse gases." A transmission line would need to run through Bureau of Land Management property, and that agency has yet to grant a permit. The U.S. Department of the Interior has raised concerns, requesting in a 2012 letter that federal and state agencies reconsider permitting the proposed project. The letter said that the National Park Service identified "serious omissions and deficiencies," and pointed out that groundwater levels have already been dropping in the area. "We're reviewing the license and we have significant concerns," Andrea Compton, the acting superintendent of Joshua Tree National Park, said Thursday in response to the commission's decision. Some residents who live near the old mine called the decision to issue a license an outrage. "This is a death knell to the Chuckwalla Valley. They will use up all of our water," said Donna Charpied, an organic jojoba farmer who during more than two decades helped rally opposition to a plan to turn the mine site into a landfill. That landfill plan suffered a final defeat last year, when the Sanitation Districts of Los Angeles County decided to scrap long-running negotiations to buy the site 50 miles east of Indio. Charpied said she thinks the proposed hydroelectric plant would be "just as damaging" as the landfill plan. "Both projects have long tentacles of destruction," she said, adding that she fears pumping large quantities of water into the abandoned mine would lead to toxic leakage and foul the aquifer. "They blasted for 50 years. It is so highly fractured that water's going to go through there like a sieve." Lowe said the pits would be effectively lined with tailings and other materials. He said it will be safe. The company also agreed to additional measures to monitor and safeguard water supplies, Lowe said. Among them, he said, the company has pledged to pay any additional pumping costs or dig new wells if necessary for any residents whose wells are affected by declines in water levels. Charpied, who lives about 2 miles from the mine site, accused the company of being deceitful. "It's just despicable that they're doing this to our community." She disputed the claim that only 1 percent of the available groundwater would be pumped from the desert aquifer. "These studies are designed to give them what they want, and FERC, which is the Darth Vader of all regulatory agencies, just goes along with it. And we are in the worst drought in history. We are in emergency stages, and they're going to build this boondoggle," Charpied said. "There will be lawsuits against this, I guarantee it." Organizations opposing the plan include the Center for Biological Diversity and the National Parks Conservation Association. "We are shocked to see FERC permit this terrible project, which will doom the local ancient aquifer in the Chuckwalla Valley and permanently change the desert landscape in Joshua Tree National Park," said Ileene Anderson, a senior scientist with the Center for Biological Diversity. Critics say building large reservoirs in the desert near the national park would throw its natural ecosystems off kilter, giving a boost to invasive plants as well as animals such as ravens, which pose a threat to desert tortoises by eating their young. "This is a frighteningly bad idea," said David Lamfrom, California desert senior program manager for the National Parks Conservation Association. "There has been a really loud outcry against this project because people are really concerned that this project will inherently contain many of the same threats as were posed in the Eagle Mountain landfill, which so many people fought for so long to eventually defeat." Mark Butler, who recently retired as superintendent of Joshua Tree National Park, agreed that introducing reservoirs would open up the area to water birds and other species that don't naturally live in this area of the desert, posing threats to animals such as desert tortoises. "It's a misguided project," Butler said, adding that he questions the plan to rely on pumping groundwater. For several years, Eagle Crest Energy has been talking with utilities about the possibility of selling them power from the proposed plant. "They've been waiting until we reached this milestone to begin more formal conversations," Lowe said. The hydroelectric plant would be built on about 3,000 acres. 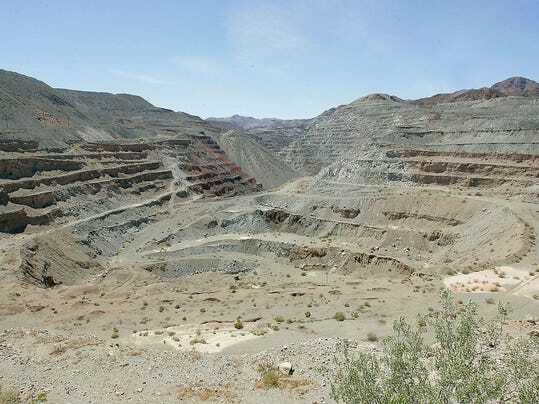 The iron mine is owned by Kaiser Ventures, and last year its shareholders voted to liquidate the company's assets. "Now that FERC has issued a license, which just happened today, Kaiser is going to be evaluating its options with that new information," said Kay Hazen, who represents the company locally. Henry J. Kaiser started mining iron ore at Eagle Mountain in the late 1940s and, in its heyday in the 1950s-1970s, the site was a thriving business, supporting a community of thousands of workers and their families. Plans for the 4,654-acre landfill, touted as the largest in California, began soon after the mine closed in 1982, sparking opposition and more than two decades of legal challenges from residents and environmental groups. The mine was originally part of Joshua Tree National Monument, the precursor of today's national park. Environmentalists have long campaigned to have the site returned to the park, citing a 1952 law that required the land to revert to public ownership if mining activity stopped for seven years. Charpied said she thinks the old mine ought to be turned into a national historic landmark.